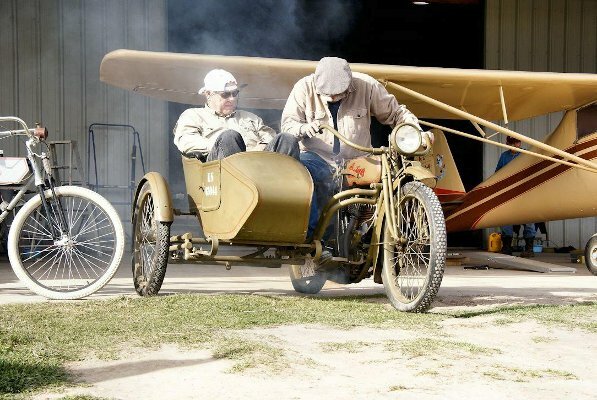 As the Triplane began flying again late last year we became aware the engine didn't seem to be developing full power and that there was a small leak in the fuel tank. The first order of business was to weigh the aircraft to get the paperwork in order. Several airplanes needed to be weighed but due to the other work the Triplane needed it went first. To access the engine controls and the fuel system the team had to first gain access to the engine and forward fuselage so the prop, engine cowl, and forward fuselage top panels were all removed and set aside. The fuel and caster oil tanks were drained and the tank was removed from the airplane. With full access to the engine controls all systems were checked. The leak in the fuel tank is located on the right forward bottom seam of the fuel portion of the tank. (The single tank is 2/3 fuel, 1/3 castor oil). Some trash came out of the oil tank as it was drained it so it seems a good flushing out would be recommended. The carb slide was found to be very stiff to move and requires lubrication, or disassembly and cleaning. It was also noted that the fuel tank needs a valve installed in the line so work can be done on the fuel system without having to drain the entire tank (cause that is a major pain in the neck - literally - given the restricted access to the system through the side and lower access panels)! The Triplane's fuel tank liberated from the fuselage. The magneto's timing was checked with a timer and issues were discovered with the magneto. One of the point's cam lobes appears to be slightly worn and is retarding the spark on every other cylinder. There is also an issue with a brush in the system, so the ignition impulses that are spot on are not as strong as they should be. On the 28th the Le Rhone's carb was disassembled. Dave cleaned the parts and reassembled the unit. The carb operates much smoother now! 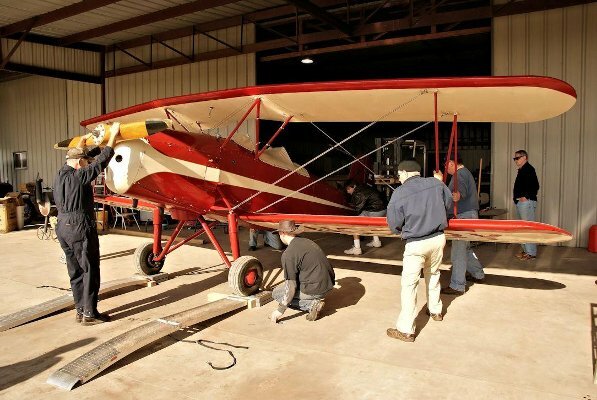 The gang tearing the Triplane apart on the 21 was Michael Craig, Ken Miner, Ian Whitaker, Dave Edgerly, and Jerry Stark. Dave Edgerly overhauled the carb on the 28th. The next workday we'll need to tackle repairs to the fuel tank. On the 21st, Dave Miller continued building wood fuselage parts for T-1, working on engine cowl cheek panel mounts and the rub strips along the fuselage longerons. He was assisted by Sam Miller. Also the belly former for T-2 was fitted up to the airplane. Bob Gardner and Jerome Matula created the leather discs that serve as anti-chafing pads for the fuselage bracing wires. Safety wiring these pads into place was started on both fuselages. On the 28th the Tommy work team consisted of Tom Miller, Steve Richardson and Jo Hunter. They finished the install of T-2's belly former, officially bolting and safety pinning the assembly onto the bottom longerons. There were missed spots on the protective paint on the turnbuckles and wires, so that was attended to as well. Also the anti-chafing pads for T-1 were finished, along with beginning the install of the rudder bar and control column. Next workday will see more components installed on T-2 while T-1 needs the cheek panel mounts finished and installed and the longeron rub strips finished. Little was done on this project aside from a little diagnostic work on the OX-5's sticking valves - exhaust valves on the middle cylinders of the starboard cylinder bank. 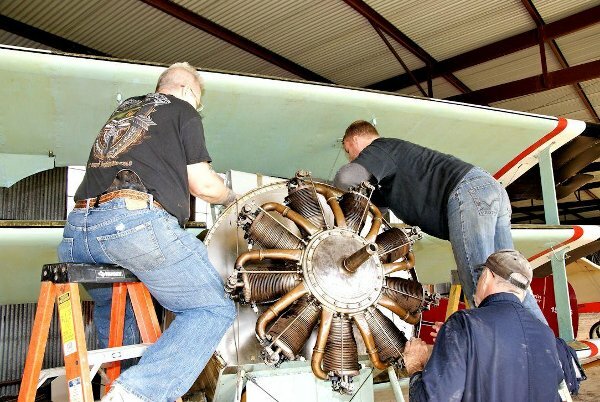 The aircraft was due for an annual, so several guys started opening up the airplane for its inspection and maintenance. Dave Orloff, Ian Whitaker, and Mike McCormick assisted Steve Freeman in working through the process. 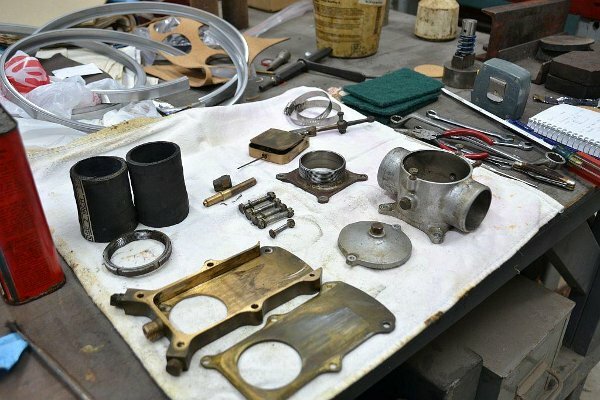 The covers for the Cub's bungee cord main gear suspension were found to be dilapidated and torn. Tammy Orloff and Diane Edgerly were volunteered by their husbands to make new ones! Several of our flying aircraft were weighed as apparently some paperwork has been misplaced. Quite a large crew muscled the airplanes around and up onto the scales to gather the data. 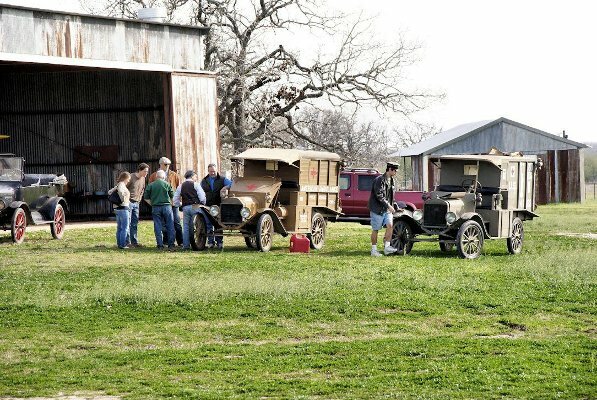 Terry Bledsoe and a small cast of hundreds located the Curtiss Challenger radial engine parts in the new hangar and loaded them into Steve's truck. Steve wants to take the engine back to Memphis and see whether it can be salvaged - this is the original engine in our Rearwin Ken-Royce racer flown by Jean LaRene back in the late 1920s and early 1930s. Terry and the guys also cleared out some Ranger engine parts from the shop's paint area and stored them in the new hangar. Team Vehicles was quite active both days. It has become a ritual to drive as many Model Ts as possible for lunch at Edna's in downtown Kingsbury! The crowd on the 21st absolutely filled the place up!! Despite all the progress that has been made on the vehicles every trip to Edna's is an adventure. Parts fall off, vehicles won't start, front wheels shimmy down the road - always something new and different. Kevin Monahan worked on the Indian on the 21st starting out trying to solve the clutch actuation problems we've been experiencing. It had been theorized that we had a bent clutch actuation rod, but Kevin removed it and cleaned it up and checked it out. The clutch rod isn't the problem. Kevin also had to clean the spark plugs and the fuel petcock to try and start the bike. Kevin took the Indian's clutch basket apart to investigate the clutch not disengaging when putting the transmission in gear. He discovered that one of the metal plates was corroded but it turned out to be flat so that isn't the source of the problem. Also the fiber plates are still amber and barely scuffed. As the workday came to a close Kevin put the clutch back together and noticed that as the clutch lever was moved back and forth that the inner clutch assembly was only being moved out at the rear, the front half did not get pushed out to fully disengage. On the 28th Kevin reworked the clutch and succeeded in getting the clutch to operate properly. It now disengages completely, allowing the transmission to be put into gear without issue. While riding the Indian around the engine stalled suddenly and refused to restart. Cameron Whitaker took the Indian magneto apart to rebuild it, trying to get it working properly. Cameron plans to rewind the mag with proper sized wires and has a new condenser for it. He also discovered a carbon brush on the back side of the points that wasn't making good contact so he intends to repair that as well. Kevin Monahan, and a friend of his, Matt Sheble, have been disassembling the Triumph to get many of the frame's black painted parts powder coated in black for a more durable, fresher appearance. It has been discovered that that technique won't work for the front fender, so that part will likely remain painted. The parts are currently being powder coated so reassembly of the bike should start soon. Al Sumrall's nephew in Victoria, Texas is doing the powder coating work and said the parts would be ready in two weeks! The big news in the land of Model Ts is that the Blue Racer has been running lately. The engine is still characterized as "tight", needing more running in to get right. Sounds like an excuse by the "T Boys" to keep driving the thing around! Cameron's Touring Car has made big progress - he has virtually rebuilt it internally and even has the lights working! The French Ambulance lost its muffler on the road to Edna's, so Ian took Cameron's car back to fetch it up. Cameron's T is reliable enough that Ian was back at Edna's well before the food was served! In addition to needing a new muffler, the French Ambulance is also having its ignition system overhauled by Cameron Whitaker. Cameron has identified 2 of the coils are bad (that is 50% of them! ); they'll need new points and condensers along with the new coils. Cameron says he has new coils if needed, but if all else fails he'll just rewind them. Cameron recently purchased some 12 miles of winding wire on e-Bay and I've gotten the feeling he is just looking for a magneto or coil to rewind! John Bush has started documenting our Ts' maintenance histories. This is a badly needed effort! On the 28th, Jo Hunter and Diane Edgerly started learning to drive the Ts. Tammy Orloff and Diane Edgerly came to the workday on the 28th and started cataloging / sorting the library. This is a big job... they were making piles of 1930s Popular Mechanics magazines, sorting them by year for starters. Not sure how far they got?